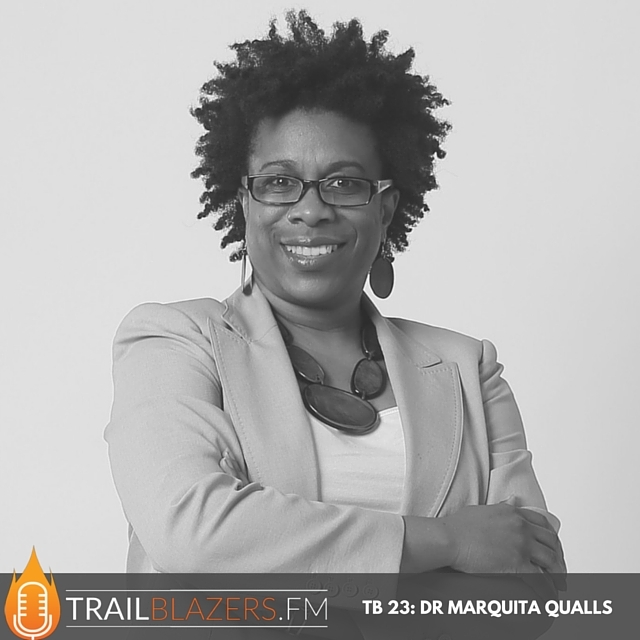 Dr. Marquita M. Qualls has over 25 years of leadership experience in consulting, coaching, and motivating people who want to produce order out of their chaos. Though a scientist by training, she commands a masterful understanding of the human aspects needed to thrive in today’s fast-paced and competitive business environment. She founded Entropia Consulting, a small management consulting firm that focuses on helping individuals become more productive and effective leaders. What inspired you to pursue a degree in Chemistry? What are some of the biggest lessons you learned about yourself during your years with Glaxo? Tell us about your transition from Glaxo to starting your own consulting business? What is the exact problem your clients are having and how are you able to help provide a solution through your coaching services? Share one of your road blocks that caused you to have to take a major detour. What happened and how did you overcome it and get back on track? How do you learn to love doing hard work you don't want to do? Why is learning a super power? What can we look forward to with you? Are there any big dreams and goals on your vision board for the next 5-10 years and beyond that you'd care to share with us? Marquita's Fav Book: Oh, The Places You'll Go! Marquita M. Qualls, Ph.D. has over 25 years of leadership experience in consulting, coaching, and motivating people who want to produce order out of their chaos. Dr. Qualls possesses the rare combination of strong technical ability and impressive soft skills. Though a scientist by training, she commands a masterful understanding of the human aspects needed to thrives in today’s fast-paced and competitive business environment. Her technical side drives an ability to gather perspectives and analyze feedback, while at the same time connecting with clients and guiding them towards achieving results. This has enabled her to function and make seamless transitions between the scientific and non-technical worlds. She has a gift for listening to what's not being said and asks the probing questions to help you arrive at a solution. Her style is often described by her clients as energetic, engaging, and empowering. She understands what it takes to be an extraordinary leader. She is a former National President of a professional technical organization and was a member of the team that created the Leadership Development System® for the American Chemical Society, the world's largest scientific society. She has also served on the editorial advisory board of Chemical & Engineering News, The Chemical Science Roundtable of the National Academies, and an Entrepreneur in Residence with Innovate Mississippi . Dr. Qualls has consulted with teams and coached professionals within governmental, educational, corporate, and nonprofit sectors including the Department of Homeland Security, GlaxoSmithKline, Novartis, Jackson State University, P&G, Purdue University, The Dow Chemical Company, and American Chemical Society, Association of Women in Science, NOBCChE and SACNAS. Dr. Qualls’ professional career was rooted at GlaxoSmithKline (GSK), one of the leading pharmaceutical companies in the world. During nearly a decade at GSK, she held roles of increased global responsibility spanning drug development, technology evaluation, program management, strategy development, and people development. She founded Entropia Consulting, a small management consulting firm that focuses on helping individuals become more productive and effective leaders. She holds a BS and PhD in chemistry from Tennessee State University and Purdue University, respectively. Based in the US, Dr. Qualls splits her time between Mississippi, Tennessee, and the DC area and has established a global client base. In her free time, Marquita enjoys traveling, cooking, and is an avid collegiate and professional football fan.